All great things have a shelf life, and our pool pumps are no exception. After running constantly for hours on end, week after week, let's face it, you'd be tired too! It's our job to maximize the shelf life of your pump and to prevent premature failure. There are a few reasons why a pump would break down. One of main reasons is there is too much heat around the operating parts. The pump filter and baskets must be completely free of debris to ensure a proper air flow around the motor of the pump. Too much dirt and rubbish will crowd the motor and prevent cool air from cooling the motor down. An overheated motor leads to a dead one. Another reason may be that the filters and piping is simply too small to allow for proper water flow in and out of the pump. This may have been a result of the poor pump installation. Think of it like a straw that is too small for the drink in your hand. Imagine the amount of energy you exert in pulling the liquid through that straw! The same will happen to your motor if the components are not properly sized. Leave it to our team to fully inspect your equipment and to take necessary action based on your unique situation. Our trained professionals will inspect, repair or install your pool pump to guarantee that the water in your pool is circulating properly. 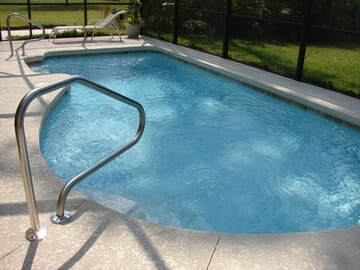 Pool cleaning, repair and maintenance is out specialty, so give us a call today or schedule a free quote!